Thus, on the one hand there are memory traces – specific configurations of – complexification; and on the other there are (let us say) complex waveforms which are the periodic correlates of these memory traces. This distinction between  and  can be read onto the distinction between thing-presentation and word-presentation, insofar as the latter is taken as being an indication of quality. They are entangled with each other, however, in the sense that each implies the presence of the other, even if a particular pattern of – complexification is only a memory trace and cannot be repeated. In his letter to Fleiss of the 6th December 1896, Freud postulated a process of stratification in which W [Wahrnehmungen (perceptions)] are neurones in which perceptions originate , to which consciousness attaches, but which in themselves retain no trace of what has happened; Wz [Wahrnehmungszeichen (indication of perception)] is the first registration of perceptions, arranged according to associations by simultaneity (; Ub [Unbewusstsein (unconsciousness)] is the second registration arranged according to the process of complexification ); and Vb [Vorbewusstsein (preconsciousness)] the third transcription, attached to word-presentation. What am I to ‘do’ with this third transcription? Freud comments that “the cathexes proceeding from this Vb become conscious according to certain rules; and this secondary thought consciousness is subsequent in time and is probably linked to the hallucinatory activation of word presentations, so that the neurones of consciousness would once again be perceptual neurones and in themselves without memory”. 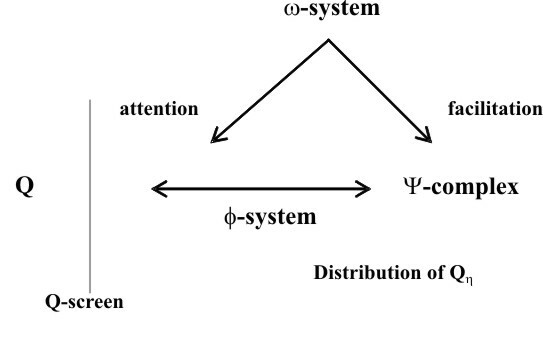 Just as perception leads through indication of perception to produce facilitating effects on the -complex, so the “subsequent in time” would indicate that the preconsciousness leads back through the system to produce effects of attention – a kind of echo. The important point here, however, is that whereas thing-presentations remain anchored in the -complex, the -system acts as a support for word-presentations, and ultimately for consciousness. This whole  system therefore acts as a kind of complex recursive structure which itself acts as a substrate to consciousness…. I want to propose a secondary stratification (the one described by Freud being taken as primary) by invoking the Lacanian reading of the project and introducing the effects of as the particular orienting of the subject’s relation to the lack of the Unconscious through the effects of the signifier. Introducing  raises the whole issue of transference, the drive functioning and objet petit a, to which I will return in order to address the discourses. 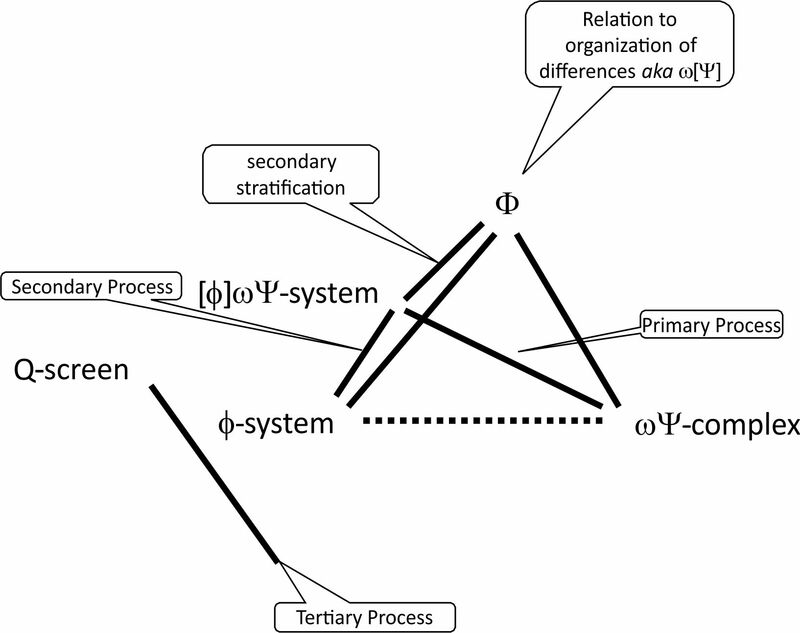 This secondary stratification can be understood as organisations of the -system itself becoming the support for ‘higher’ systems of signification. The dotted line is there because the -system does not affect the -complex in ways which are not mediated by the []-system. There is no direct relationship possible, therefore, between  and . The secondary stratification takes place on the other axis of [] to . Why this topology? Because it is the structure of the ‘quadripod’ which Lacan describes in Savoir (p57-58 – Feb 3rd 1972 Seminar) and which determines the “fundamental topology from which any function of speech derives”. These organisations of word-presentation would be through the effects of metaphor and metonymy – condensation and displacement – the structural characteristics of which are taken up later in To ‘contain’: signifiers, signified and thirdness.